GARDENA Pumps have been designed for private use around your house and garden. They are predominantly destinated for drainage after flooding, transfer of liquids, draining containers, taking water from wells and shafts, draining boats and yachts as well as for water aeration and circulation for a limited period of time. 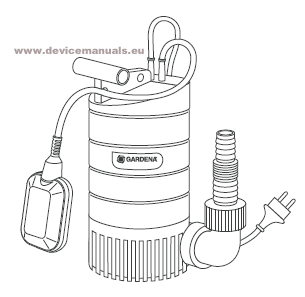 Liquids which can be handled by the GARDENA Pump are the following: clean and slightly contaminated water max. particle size 9000 S Inox = 5 mm, swimming pool water (prerequisite is the recommended dosage of additives) and soapy water. The pumps are fully submersible (waterproof sealed) and can be immersed in the liquid down to a depth of 9 m.
The GARDENA pumps are not designed for continuous operation (e.g. continuous circulating operation) in a pond. Your pump’s life will be shortened correspondingly by such operation. Corrosive, easily combustible or explosive substances (e.g. gasoline, petroleum, nitro thinner), fats, oils, salt-water and waste water of toilets and urinals must not be pumped. The temperature of the liquid handled should not exceed 35 °C.